After this, Nikolic and Aliyev will address the media. 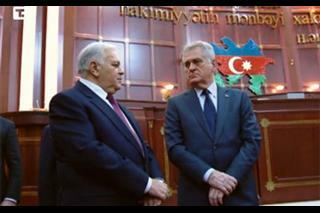 Earlier on Thursday, President Nikolic also met with Azerbaijani Prime Minister Artur Rasizade and Parliament Speaker Ogtay Asadov.Nikolic and Azerbaijani officials agreed that the elevation of the two countries' relations to the level of strategic partnership would open room for more intensive foreign exchange and investments.They also stated that mutual support in terms of respect for international law and territorial integrity is very important.In the opening address to Nikolic and the Serbian delegation, Asadov expressed the belief that the two countries share friendly ties and that they would always support each other, especially in terms of respect for the principle of international law.Recalling that Azerbaijan has had an unsolved problem with Armenia concerning Nagorno-Karabakh for 20 years now, Asadov said that although no progress has been made so far, Azerbaijan still hopes the problem would be resolved by peaceful means.The Azerbaijani parliament speaker expressed the hope that Serbia would maintain its stand on respect of international law and that it would support Azerbaijan's territorial integrity. Pointing out that the two countries' relations would be elevated to the level of strategic partnership, Asadov recalled that 19 bilateral agreements have been signed so far and that there are good grounds for further improvement of cultural and scientific cooperation.As for the two countries' economic cooperation, Asadov said that it does not correspond to the potentials at the moment but he expressed hope that this would change soon.Nikolic underscored that he is always glad to visit the parliaments of the countries he travels to because he himself served as MP for 20 years, of which 18 as a member of the opposition. Before meeting Asadov, Nikolic visited the building of the parliament which was reconstructed 5 years ago and signed the guestbook.